The UF Large Animal Hospital is pleased to announce an exciting new service exclusively for our clients. As of July 1, we have launched our Equine Extended Care Service, providing exceptional medicine and experienced care for your horse. Click here to email us or call (352) 392-2229. When should I consider extended care services? 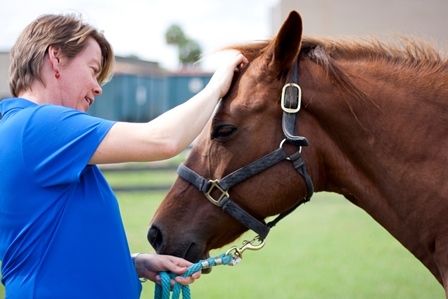 If you and your veterinarian decide that your horse is ready to leave the hospital, but may still need continued diligent and quality medical care, the UF Large Animal Hospital is here for you! Our Equine Extended Care Service is a cost-effective, long-term care option for your horse. We create a customized plan to meet the special needs of your horse. For example, many patients of the UF Ophthalmology Service requiring frequent eye medications can benefit from our Equine Extended Care Service. We offer services for horses that require regular wound care, bandaging, monitoring of casts and splints, and administration of medications. We also provide services for horses that have undergone surgical procedures, horses that are recovering from orthopedic injuries, and much more. Our Equine Extended Care Service provides extended care to our existing patients and clients. New patients do require referral from your veterinarian. We will work closely with your veterinarian to determine your horse’s specific needs. How long can my horse stay? Because each horse and horse-owner is different, our service is customized to meet each of your needs. A minimum period of one week of care is required, and there is no limit on how long your horse may receive care. Will I be able to visit my horse? Absolutely! We have established visitation policies designed with the highest care standards in mind. This sounds expensive. How much will it cost? Extended care is much less expensive than traditional hospitalization. Typical services included in our Equine Extended Care Service are medical treatments, boarding, daily walks and grazing, and routine feeding. Fees are based on the amount and frequency of care required. Medications and medical supplies may be provided at an additional fee. In case of an emergency, what veterinary medical care will my horse receive? The UF Large Animal Hospital is home to the finest board-certified veterinary specialists in the world. Our patient care team is specially trained to provide round-the-clock exceptional care.